Described as a "gritty medieval story," 'The Last Siege' introduces a mysterious stranger, a juvenile heir to the throne, and a kingdom as the sole holdout in a war against a conquering tyrant. First issues are vitally important. It's the first impression for a prospective reader and it can mean repeat business or one-and-done. Unfortunately, 'The Last Siege' by Landry Q. Walker, Justin Greenwood, and Eric Jones is a toss-up. It's a competently put together comic with great art, a promising premise but the debut doesn't grab you and make you yearn for more. In a land ravaged by war by a powerful invader from across the sea, the last remaining castle has lost its king leaving his heir, an 11-year-old girl, to try and somehow stabilize the kingdom. The invading king has sent his cruel knight, Feist, to conquer the castle and marry the princess. A stranger arrives and quickly makes waves. This is the general idea behind 'The Last Siege' and it's a great pitch, this mash-up of medieval war and Spaghetti Western has the potential for great storytelling. What undermines the issue is the slow start and something I thought I would never say, the lack of exposition. The first five pages are beautifully composed by penciler Justin Greenwood and colorist Eric Jones. It marks the arrival of a hooded stranger and his horse during a dark and stormy night. He enters the castle walls amid a bustling marketplace. It's very reminiscent of Clint Eastwood's Man with No Name who comes into town quietly looking for a drink not asking for trouble (but finds it anyway). And like those Sergio Leone westerns where the hero's introduction is silent except for Ennio Morricone's gorgeous score, the first five pages don't have a single line of text, exposition or dialogue. It sets the tone but after reading the entire issue I realized I could have used more exposition and context sooner. And then some of those events that followed could have come earlier or merely been captioned. Some of these plot points are familiar tropes and not necessarily worth playing out on the page. Had these things happened sooner perhaps a different cliffhanger could have been more impactful. The creative choices that were chosen play it too safe resulting in a comic that is fine but doesn't elevate the material. There isn't any character development except for these sketches we get of the Lady Cathryn from the advisors' point of view and the obvious villainy of Feist as a tyrannical knight. The plot is by-the-numbers and there aren't enough fresh components to spark additional interest in the next chapter. 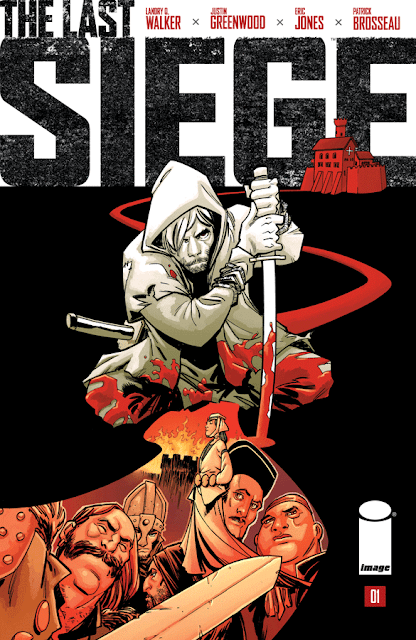 'The Last Siege' could become more engrossing in the next couple of chapters but the first issue relies on well-worn tropes and little character development. It's a serviceable debut with great art and a promising premise but fails to excite with any innovation or impact. This could still live up to its own ambitions if it abandons the slow burn storytelling and picks up the pace.